The Dickeyville.org website is managed by a web editor (Sheridan Jones McCrae), and web supporters (TBC). We aim to share news updates and responses to queries about once each week. Please note – these are not full-time or paid roles, so we rely on support from village residents, in the form of regular content contributions. The best ways to contribute content to this website are featured on the About the Village Blog page. For questions, comments and reporting broken links or other faults about the Dickeyville website, please contact the Web Editing team by emailing to dca.webeditor[at]gmail[dot]com or completing this Website Contact Form. Content on this site is produced by many Dickeyville residents who generously share their time, writing talents and images by contributing to the Village Blog, Visual Galleries, Events Calendar and Residents’ Resources. The current website was designed by village resident, Sheridan Jones McCrae in 2015 using WordPress. The design process included significant input from fellow residents during interviews and an online survey. The orange/grey/green/white color scheme reflect the village homes, brick pathways, field-stone walls and surrounding forest. Sheridan is a multimedia communications specialist who enjoys sharing stories and knowledge about public health and environmental links through use of photography, video, writing and digital strategy. Originally from Australia, she has lived in the village since 2013 with Scottish husband, Dave and loves mountain-biking, running and walking her dog, Finn on Dickeyville’s nearby trails. 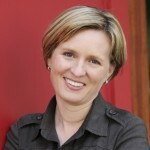 You can learn more about Sheridan’s professional profile on LinkedIn here. The logo featured on the website was created based on signficant creative contribution from Sheryl Schmidt. Dickeyville thanks previous resident Sheryl Schmidt, who generously contributed her artwork – a representation of the village township that is a focal point in the new Dickeyville logo. The township scene also featured on previous year July 4th parade t-shirts and coffee mugs given to new residents. 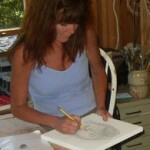 Sheryl Schmidt is a professional oil painter with over 20 years of experience in producing, selling, and teaching art. She has a BFA Degree in Painting from the San Francisco Art Institute. 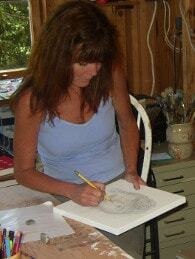 She is also a certified color consultant, stages at homes with her work, and accepts commissions. Sheryl has both instructed in college classrooms and taught privately to adults, young adults, and children. She has a true passion for art and painting the landscape. Most of her inspiration comes from the outside and the people she sees there. Sheryl has relocated to the East Coast, her true home, where she plans to paint, teach, learn, travel, walk the beach everyday with loved ones. You can view more work at Sheryl’s website.